Mark Zuckerberg chats with followers during a Facebook Live session (Oct. 11, 2016). Chatting with folks from around the world during an impromptu Facebook Live session before the second presidential debate Sunday, Mark Zuckerberg revealed interesting tidbits about his life while chilling in his Palo Alto backyard. 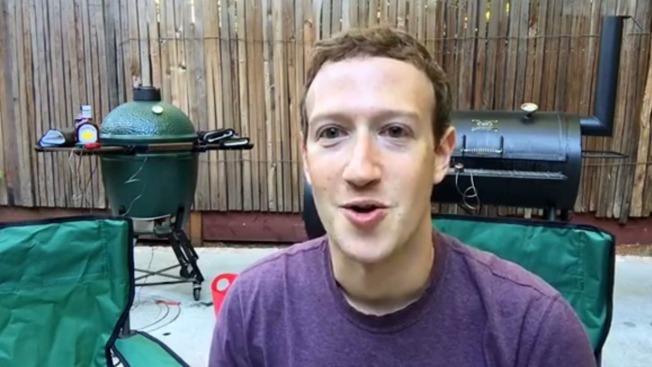 Sitting in a green camping chair with two smokers barbecuing slabs of meat behind him, the Facebook founder and CEO chatted with droves of Facebook users and, among other nuggets, mentioned that he is a fan of foraging for his own protein. "Half of the joy is that things taste better when you make them yourself," Zuckerberg said. "They taste doubly better when you've hunted the animal yourself. Whether you're fishing for the salmon or going hunting for a boar, that's a big part of it. You feel more connected to what you're doing and what you're eating and then you cook it yourself and it's this whole experience." The technology guru said that he has thoroughly enjoyed hunting for roughly the last four to five years, but doesn't get around to it too often. "It's good," Zuckerberg said. "It's a good way to feel connected to nature and I feel like if you're going to eat meat, then you should get to know where it comes from." Aside from his dietary preferences, Zuckerberg threw in that he's training for a triathlon with some friends before diving into a tangent about his ideal barbecue sauce selections. "Sweet Baby Ray's" happened to be his pick for this cookout. It may also be worth mentioning that the loyal Facebook Live listeners — roughly 130,000 strong at one point, according to Zuckerberg — were treated to a quick glimpse of baby Max, wife and mother Priscilla Chan, and the family's Hungarian sheep dog named "Beast." Following the half-hour conversation, Zuckerberg departed with a Lagunitas Brewing Company beer in hand to satisfy his cravings on a bountiful feast, which included smoked brisket, ribs, mashed potatoes, brussels sprouts, carrots and corn bread.